Blood donation site coordinators from left: Wendi Bigelow for Marengo UMC, Sally Sayers atTrinity UMC, Doris Hildebrand at St. John’s North Woodbury, Dwight McFarland and Nancy Foos, who are coordinators at-large for Morrow County and Ruth Logan at Trinity UMC. Some of the 10 gallon plus donors who were honored at the Red Cross recognition banquet. 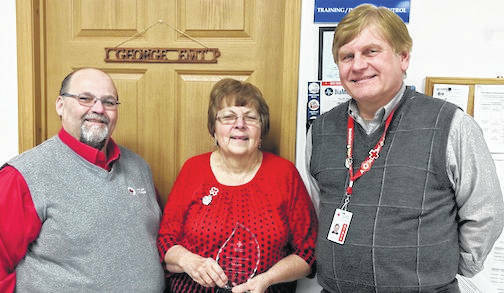 From left: Red Cross North Central Ohio Chapter Director, Todd James, Karen Fishburn Award recipient Rita Barton, and Regional Volunteer Coordinator, Mike Vance. MOUNT GILEAD — American Red Cross of North Central Ohio Director, Todd James welcomed 75 volunteers and blood donors Monday, March 25 at the Mount Gilead EMS headquarters. 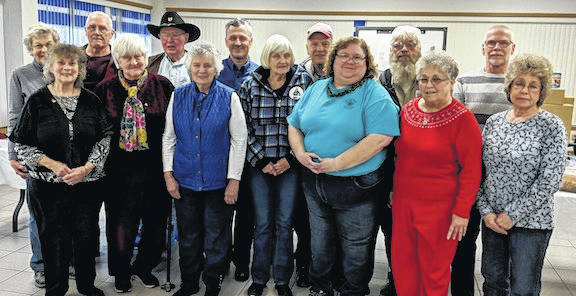 Volunteers enjoyed a banquet of pizza donated by several local pizza restaurants followed by a selection of cakes and desserts, before James spoke about the accomplishments of Red Cross volunteers in the county and around the nation. “The people in this room have saved thousands of lives with their blood donations,” James said and then reported that over 700 Red Cross volunteers from around the country are out in the flooded disaster areas of the Midwest this week. Blood donor coordinators Becky Glass and Rita Barton honored community chairmen of blood donation sites in the county including: Wendi Bigelow Coordinator for Marengo UM Church, Sally Sayers and Ruth Logan of Trinity UM Church, Doris Hildebrand of St. John’s in North Woodbury, and Nancy Foos and Dwight McFarland who are at-large coordinators for Morrow County. 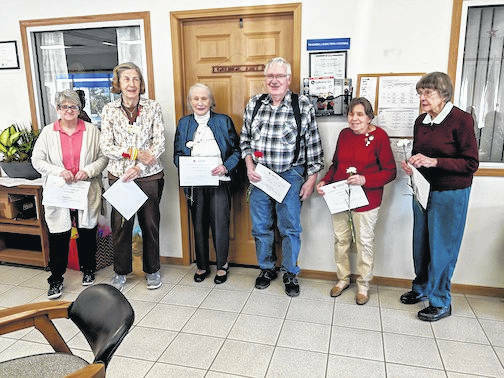 Blood donors present who were honored for donations of 10 gallons or more were: Atlee Raber, Jim Anderson, Marsha Crawford, Dorothy Burgraff, Angie Bush, Suzi Colgrove, Robert George, Dale Lambert, Renee Ness, Lawrence Shipley, Arnold Swisher and Bill Williams. “It is really great to get that email after we give blood now, telling us where our blood went and how that blood was used,” George said. Blood donors present who were honored for donating more than 15 gallons of blood were: Esther Yake with 16.25 gallons, Jack Pollard with 18.375 gallons, Susan Pollard with 18.5 gallons, Gerald Peyton with 21.875 gallons, Allen Stojkovic with 29 gallons and Donald Strohl with 29.125 gallons. Mike Vance who is regional volunteer specialist for eight counties spoke about the continuing need for volunteers and special projects. The “Sound the Alarm” project has placed thousands of smoke alarms in homes throughout the region free of charge. Other projects are “Totes for Hope,” “Java for G.I.s,” and the “Pillowcase Project” for teaching kids to how to be prepared in case of fire or other disaster. Vance thanked Dwight McFarland, Brenda Harden, Rita Barton and Nancy Bruce for working with special projects. Sames & Cook is working with the Java for G.I.s project. Adam Warnament presented the Morrow County Disaster Team and invites more to volunteer with them. They include: Rod and Mary Damico, Mark Goossens, Jocelyn Fykes, Rob Goodwin, Dwight McFarland, Jessica Scott and Monica Swank. Vance introduced the Volunteer Leadership Council: Rita Barton who is Volunteer leader, Susan Grundy, Howard Hall, Brenda Harden, John Hinton, Ruth Logan, Connie McChesney, Dan and Jan Rhodebeck, Dwight McFarland, Jocelyn Sikes, Jackie Weaver and Andy Wick. The crowning event of the evening is the presentation of the Karen Fishburn award for exceptional service and stewardship. This year’s recipient is Rita Barton who has served the chapter as both director and presently as a volunteer. Vance noted that criteria for the award is a volunteer who has done Red Cross work for several years and has sustained leadership, taken on challenging responsibilities, has inspired others and has achieved extraordinary results for the community. He said Barton has contributed most recently by going into schools with the “Pillowcase Project” to teach children what to do in case of emergency.